If you’re anything like me, chocolate does not last long in your house. I was having one of those desperate, late night cravings, searching every cupboard where maybe I had a secret stash of chocolaty goodness. I could not find a single morsel, but did find coconut oil, cacao powder, and maple syrup. 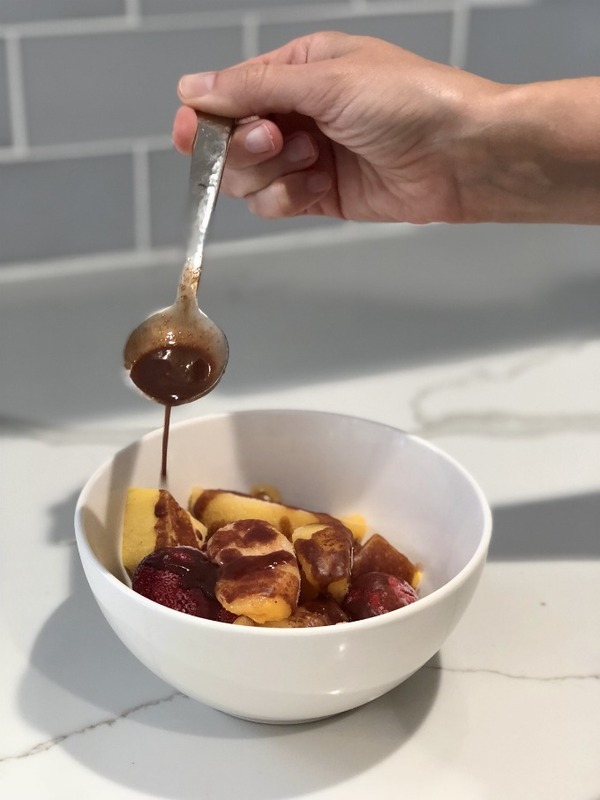 Behold this delicious chocolate drizzle, that resembles “Magic Shell” – you know the store-bought syrup that instantly hardens when it touches your ice cream. I was inspired to create my own healthy magic shell when my local juicery was serving a clean version they use on their soft serve. I’m so happy I can now make instant chocolate with ingredients I already have on hand! Coconut oil hardens at cooler temps, so that’s why frozen fruit, yogurt, or ice cream is perfect to pair with your drizzle. My favorite has been frozen strawberries, or mango – add some peanut butter and a sprinkle of pink salt – OMG YUM. Maple syrup adds the perfect sweetness, since cacao alone is very bitter. But any other natural sweetener would work just as well; I love honey, agave, stevia, dates and monk fruit! Please get creative and go crazy with toppings! I can’t wait to see what you find to drizzle!